About 6 seconds./about 5 seconds. This review is about item#36794545. Since the main body of the device is a unit, it is not connected unless it is exchanged with the same product, so purchase. There are no improvement points. This review is about item#36794642. Although operation is slow, (switching) After turning the power is turned off, it also makes energy saving. Using a thin screwdriver, etc., manual opening and closing is very laborious, I think that it is very good if manual lever or the like comes with it. 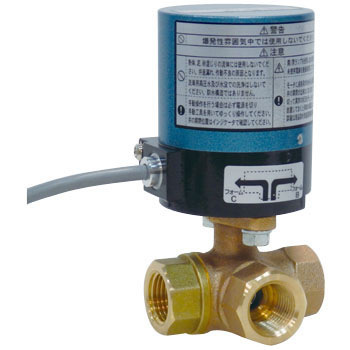 Because it is equipment of 20 years ago, there are valves that are out of stock at manufacturers and it is saved. This review is about item#36794536. At the time of switching, it was saved that the display circuit for each position signal is attached to the standard. In the future, if there is a function (dry contact output) that can be used in the control circuit, it will be helpful because mutual interlock can be assembled. This review is about item#36794527. I liked the feeling that it surely switches at the changeover switch ON. This review is about item#36794554. Although I have used this product many times, it is cheap and I appreciate it. This review is about item#36794667. We use it to raise the temperature of the bath. Switching frequency is low, but switching is best for long time use in that state. Compared to general solenoid valves, continuous energization is not possible and reliability is high.